Why is it that every time I admit to really liking Tom Green's shows and movies, I feel a compulsion to apologise and once again, I am sorry but I think this guy is sensational. Green's charm and appeal is that quite simply he is fully prepared to make a total fool of himself in order to get a laugh. 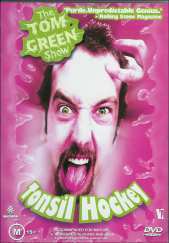 As a result, others will unwittingly assist him in creating the chaotic comedy that makes the Tom Green Show what it is: Madcap Comedy. The disc is not for those easily offended and certainly not for everyone the way that we'd recommend other comedy titles. As with anything Green puts his twisted mind to, I laughed until I cried all the way through the feature at the absurdity of it all. The humour is puerile, infantile and hilarious, pushing the boundaries of accepted good taste to new levels. There are about 39 skits featured on the disc and whilst all of them are worth watching, I did have a couple of favourite, one of which involved Tom grabbing control of the PA system in various stores and calling out for a "lost" brother. There are always stomach turning skits when we are talking about Tom Green branded comedy and in one scene, Tom finds a dead moose by the side of the Highway and tries to "hump" it back to life to the disgust of everyone watching. I think a large part of the humour relies heavily upon the cringe factor and the disbelief that he is actually doing what you are seeing. As far as being on DVD format is concerned, the image and sound are not anything to write home about as most of the material was originally recorded on camcorders and mikes in the open air and general street environments. The audio however is clear and audible and you don't miss out on any of the humour to shoddy sound. Extras are pretty few, however one of the most uncomfortable skits to watch is in this section and whilst I can't really go into detail within this forum, it is interesting to see what Tom's own crew think of some of his work. There are pictures and bios available in this section also. I fully recommend this disc to anyone who likes something a bit out of the ordinary and is not afraid to explore their funny bone to see what the wonderful Tom Green has to offer.